there are no absolute physical constants through the whole Universe, neither the speed of light (like the "vacuum"-speed of light) nor the gravitational constant (like the Newtonian gravity constant). such exotic "states of matter" as the "neutron stars" or the "black holes" are nothing but science fiction. 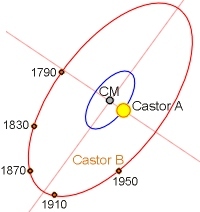 Both the main star (Castor A) and its smaller companion (castor B) revolve the global center of mass (here denoted as CM). In the simplest version of the theory, we assume that this central point don't have "to contain" any real physical mass. Pluto was the first discovered object of our Solar System combining two lowest levels of the Cosmic Hierarchy of the system. 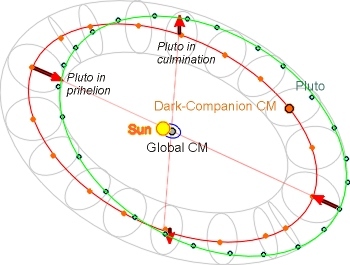 Pluto revolves the global center of mass of the whole system and simultaneously the center of mass of its own level, the mass of the Protosolar "Dark Companion", today distributed along the whole Kuiper Belt. Pluto reaches the distance of about 30 AU in its perihelion and goes away as far as 50 AU in its aphelion. With the same cycle of 247.19 years, Pluto revolves also the center of mass of the Dark Companion on a vertical orbit with a radius of 10 AU. The total mass of the Dark Companion was about two percent of the Solar mass; it means about 17.5 Jupiter masses. More information about the Pluto orbit and about the Venus location in our global center of mass can be found in my recent book "Unified Physics". 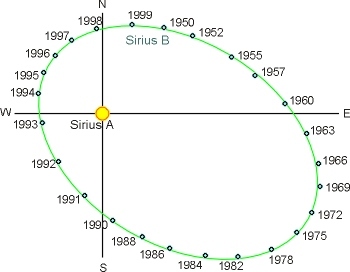 The observed relative motion of Sirius A and Sirius B is shown above. Sirius A seems to be larger than the Sun, whilst Sirius B is not larger than the Earth. If we assist to consider Sirius B as a star, we have no possibility to explain such a behaviour of these two objects without some nonscientific assumptions. One such assumption was a "superheavy state" of the Sirius B, introduced in the traditional astrophysics as a "neutron star". However, such a state is completely unrealistic, never being realized in Nature. Therefore the dynamics of the Sirius system cannot be solved with it. Much more reasonable possibility is to consider Sirius B as a planet of the Sirius system. The problem is to know the real distances between the members of the system as well as their periods and masses. From the presently known data we are able to consider, for example, the situation as shown in the above graphics. 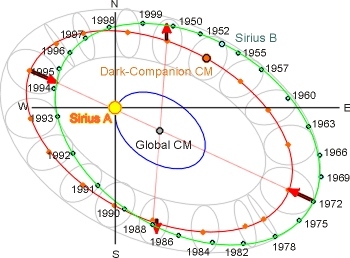 One still undetected mass of the order of Sirius A orbits the global center of mass of the system and is responsible for the relatively large observed shift of the center of the global mass away from Sirius A. 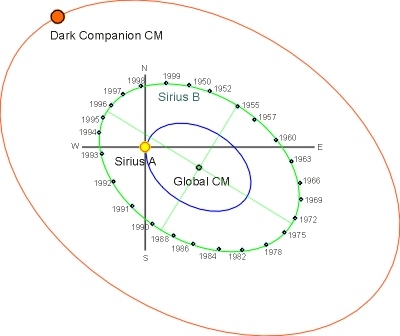 However, much more probable seems to be the above situation, in which we consider a relatively smaller mass of some (still unknown) stellar object (or its remnants after a disruption like in the case of the Sun's companion) revolving the global center of mass of the Sirius system on the orbit simulated through the red ellipse on the above picture. In that situation Sirius B revolves the both centers of mass, like Pluto in our Solar System. Alpha Centauri A is a yellow star with exactly the same spectral type as that of the Sun. Therefore its temperature and color also match those of the Sun. Alpha Centauri B is a something smaller, orange star. Whereas Alpha Centauri A and B are stars like the Sun, Proxima is a dim red dwarf - much fainter, cooler, and smaller than the Sun. Proxima is so faint that astronomers did not discover it until 1915. Alpha Centauri has been already for a long time considered to be a special place, because it may offer life conditions similar to our Solar System. However, because of the Naturics discovery that the distances outside the Solar System have to be scaled with much smaller speed of light than the "vacuum"-speed of light, we cannot be sure at the moment, which the real distances and sizes in the visible systems like Alpha Centauri or Sirius actually are indeed. Nevertheless, from the spectroscopic analysis, we can be sure that Alpha Centauri A and B are stars rich in heavy elements, containing enough of them to build rocky planets. 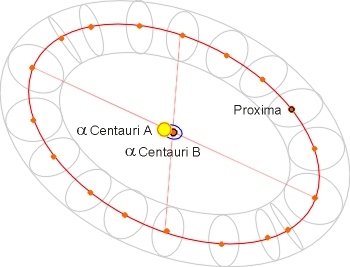 In conclusion, as we see in the last picture here above, Proxima Centauri is very likely a dwarf star with its own planetary system, like Pluto has its moons. Proxima b seems to be the largest of them. However, it will also be interesting to study the Castor B planetary properties soon.